Aeolus Energy of Orlando, U.S.A, has signed an agreement with the Ulstein Group to design the first Jones Act compliant Service Operations Vessel (SOV) for the U.S. offshore wind market. Additional plans for the fleet include cable ships, crew transfer vessels and hotel ships. Jones Act compliant vessels are built at a U.S. shipyard and crewed by American Citizens. Aeolus has contracted Ulstein Design & Solutions, B.V. for its SX195 design SOV, which will be fully customised to Aeolus’s specifications and U.S. Coast Guard requirements. The Walk to Work vessel will feature the X-Bow and X-Stern hull forms. The contract also marks Ulstein’s first venture into the U.S. offshore wind market. Damen Shipyards Group announced on 7th November that the keel-laying ceremony for the CEMEX Go Innovation had taken place at Damen Shipyards Mangalia in Romania. The vessel is the first Damen MAD, the next generation of Marine Aggregate Dredgers. Damen has designed the future-proof vessel for long-lasting durability for operations in North Sea conditions over the coming decades. Particular attention has been paid to sustainability, safety and performance. The MAD will extract sand and gravel from the seabed at up to 55m. During the ceremony, CEMEX Marine Fleet Engineering Manager Mark Williams undertook the traditional role of welding the coins. On this occasion the coins used were a British Pound, a Dutch Guilder and a Romanian Leu, commemorating respectively the regional base of the client, the home country of the shipbuilder and the location of the shipyard. The keel-laying is the first to take place since Damen began the operational management of the shipyard now known as Damen Shipyards Mangalia in July 2018. The Black Sea coast facility has three drydocks with a total length of 982m and 1.6km of berthing space. The 48m and 60m wide docks provide Damen with the capacity to cater for larger maritime vessels and structures. 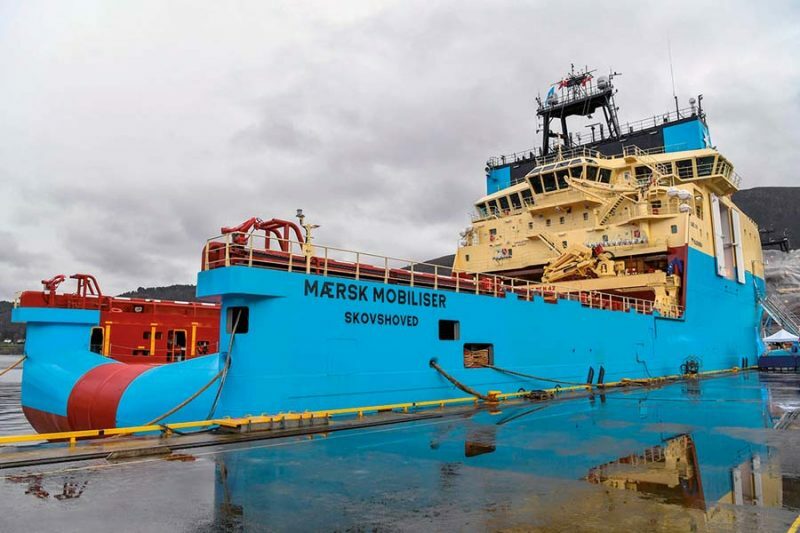 Maersk Supply Service A/S took delivery of the 10,181gt/2018 built Maersk Mobiliser (above) on 31st October from the Kleven Shipyard in Norway. This is the fifth vessel in a series of six Starfish Class anchor handlers. This Salt 200 design is equipped with a range of innovative features, a characteristic that has secured all the sister vessels work from the very beginning. Like her sisters, the Mærsk Mobiliser offers an open deck space of more than 800m2, with an additional covered deck space of 102m2. The vessel is equipped with a 450-tonne anchor handling winch housed in an enclosed garage to protect the crew and the equipment in harsh conditions. She has Ice 1A classification and is prepared for oil recovery. The bollard pull of the vessel is measured at 260 tonnes. Sentinel Marine has acquired a multi-role ship from a Canadian company and she underwent overhaul and refurbishment in dry dock at Aberdeen, emerging on 14th October. This PSV/ERRV will be ready for service in November under the name of Scotian Sentinel. The Aberdeen-based firm has just seen the eighth of nine newbuild ERRVs commence operations in the North Sea, namely the 2,173gt/2018 built Bailey Sentinel. The ninth vessel will be delivered in 2019. The recent investment has resulted in dozens of new jobs being created both on and offshore, with 350 people now employed by the firm. The growth in staff numbers at Sentinel Marine’s Aberdeen headquarters has led to the firm relocating to new, larger premises at The Exchange on Market Street.